Great value and nice looking table. 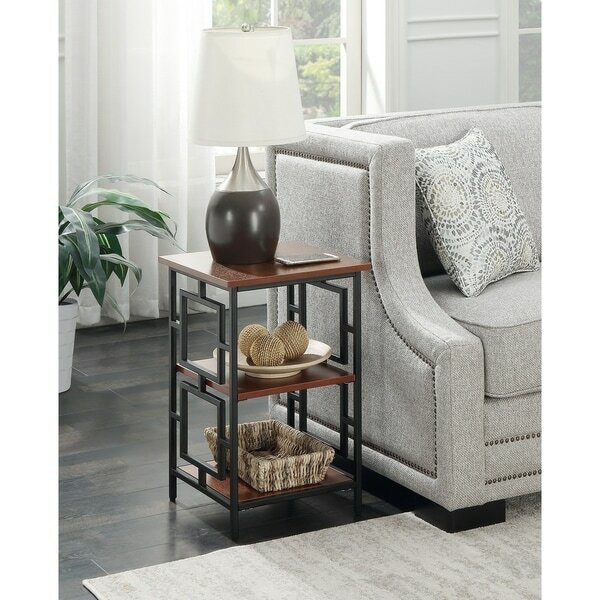 Give your space a handsome upgrade with the Town Square Metal Frame End Table. This charming accent table blends a classic look with a contemporary design. Boasting clean lines paired with geometric side framework constructed from powder coated metal, this piece is engineered for durability that is made to last. Open shelving made from manufactured wood allow plenty of space for you to fan out all of your favorite magazines with lots more room for storage baskets or collectibles that you would like to display. Top it off with your favorite family photos or a perfectly potted plant to add some botanical flare. Place this table on either side of the sofa for a comfortable seating dynamic or between two chairs for a pleasant conversation nook. Look for other items from the Town Square Metal Collection by Convenience Concepts sold separately. This table is perfect for displaying framed pictures in the family room. I have a vertical 10" frame on top, a vertical 7" frame on middle shelf and a 10" horizontal frame on bottom shelf. The table is stable and once assembled appears sturdy. The black metal work with the mahogany top looks great together. The item lost a star because the assembly instructions had errors in the numbering of parts in different steps. It took me 1 hour and 15 minutes to assemble it by myself. I suggest getting someone else to hold pieces together while you put the screws in. The table is exactly what I needed for my digital frame. These are great tables. I bought 2 for my living room and they have plenty of room to place a nice sized lamp on, which I wasn't quite sure about because they looked slightly smaller in the product photos. Another solid product that is better quality than I could have hoped for. Very easy to put together. I would recommend this product to others. Love this. It’s just a perfect size. Not too small and very functional between 2 chairs. And the wood and metal goes with everything. Looks great. Easy to assemble. The perfect size for a small bedroom. It looks way more expensive than what it cost.